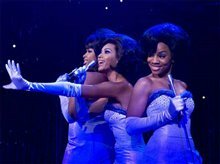 Set in the turbulent late 1960s and early '70s, a trio of women -- Effie (Jennifer Hudson), Deena (Beyoncé Knowles) and Lorrell (Anika Noni Rose) -- form a promising girl group called The Dreamettes. At a talent competition, they are discovered by an ambitious manager named Curtis Taylor, Jr. (Jamie Foxx), who offers them the opportunity of a lifetime: to become the back-up singers for headliner James "Thunder" Early (Eddie Murphy). Curtis gradually takes control of the girls' look and sound, eventually giving them their own shot in the spotlight as The Dreams. That spotlight, however, begins to narrow in on Deena, finally pushing the less attractive Effie out altogether. Though the Dreams become a crossover phenomenon, they soon realize that the cost of fame and fortune may be higher than they ever imagined.